Is it that time of the year already? I couldn't believe my eyes last week at Fiesta Farms. There was a huge pile of gorgeous local heirloom tomatoes. I'm still scratching my head over this. Isn't it still a bit cold for tomatoes? We even had a snow frozen rain storm last night, and the one warm day we had last Monday couln't have harvested fruits of this size. 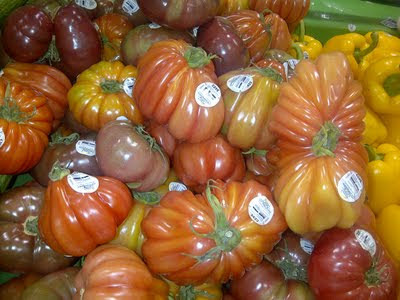 Heirloom tomatoes are a visual stunner, although I find the flavor can be hit or miss. Somehow I managed to pass up on purchasing one, I was on a mission that day, and I promised myself not to veer off course. I couldn't hold back from taking a few pictures though, they are just so pretty. If any of you have visted Fiesta recently, pick one up and let me know how they taste. One of my most favorite things about making risotto at home is the chance of for leftovers at the end of the meal. Risotto the next day isn't too appetizing on it's own, in fact for me once risotto has cooled to room temperature I've lost interest in it completely. The key to a perfect creamy risotto is to serve and enjoy it right away. Once the satisfying rice dish cools it becomes stiff and cement like loosing all it's luster. That is until the next day when the pliable rice patty can be formed into balls then stuffed with beautiful cheese, coated with bread crumbs and fried to perfection. This dish is know as Arancini named for it's appearance and resemblance to an orange (in Italian orange means arancini). The dish originates in Sicily and can be found filled with meat, nuts, mushrooms or cheese and served with marinara sauce or on it's own. This simple dish is a wonderful appetizer and will definitely wow with or without a surprise filling. PREP: cut small (bite size) pieces of mozzarella then take table spoon of rice and mould around the cheese to form ball. * if rice doesn't stick together you may quickly blend it to make a paste. Once all the rice balls are formed then create a dredging station of egg, and panko each in their own small bowls or plates. First dip the ball in the egg, then roll into the panko... do this for all of the balls. COOK: Heat your oil in a medium frying pan with about an inch of oil (the arancini will be shallow fried ie. not completely submerged in the oil which is a deep fry) I don't use a thermometer, but if you are using one to check your temp for frying you'll want it to be at around 350. To test the oil without thermometer just toss in a small amount of panko (or make a small sample arancini) you'll want little bubbles to start forming right away. Be very careful frying the oil can splatter and easily burn you. Only put a few arancini in at a time - do not overwhelm the pan (this will drop the temperature of the oil too quickly and the balls will fry up gross and greasy). Fry in batches and have a paper towel handy and place the cooked rice balls after removing from oil. The balls will only take a few minutes until they turn golden. If you desire lightly salt and pepper the ball when they come out of the oil - I just grate some of the cheese on at this point since the risotto has already been properly seasoned. SERVE: As I said before you can serve with simple marinara, but honestly the beet risotto is excellent in it's own. I served with a simple arugula salad with citrus vinaigrette, we didn't even touch the tomato sauce. dinner party that was inspired by my favorite restaurants Asia de Cuba and Sushi Samba both have multiple locations around the world, and are heavily influenced by Latin and Asian flavors. I wanted to give you a glimps of the dishes I prepared for the evening. One of the appetizers was this delicious Sesame crusted tuna tostada. Clearly this photo was taken a while back, because I can confidently say my skills have gotten better since then. Also in a mad rush to feed my party guests and finish 10 dishes with out a sous chef a realize I forgot one of the components of this crowd pleasing dish. Aahhhh well there's always next time. PREP: Chop tomatoes and chives. FOR TUNA: trim your tuna and rub a small amount of oil (any oil thats flavorless) all over to help the seeds stick to the flesh. On a clean dry plate add sesame seeds a little salt and pepper, then roll tuna so that seeds cover every side. COOK: In a non stick pan heat a very small amount of canola oil, when the oil is hot place the tuna - make sure is sizzles when it first hits the pan, and then turn the heat down slightly. Sear on each side for 30 seconds to 1 minute depending on how thick the fish is. Remove from heat, and let stand for a few minutes or if serving later refrigerate (to stop the tuna from over cooking). When ready to slice use a very sharp knife and care fully cut into thin slices. TO SERVE: place a dollop of guac in the middle of the corn chip and smear in a circle, place seared tuna on top. Then sprinkle diced tomatoes and chives over everything if you want a little flaked sea salt is also nice. Enjoy!